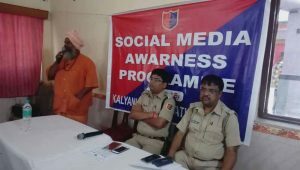 Kalyani, July 17: In a bid to make people aware about the misuse of social media and its legal implications, the Nadia police today launched a drive across the district under which it has started sensitizing representativs of the local administration, teachers and senior students of schools and colleges so that they come up to educate people at micro level to refrain them from spreading any message of religious hatred in particular. The initiative which would continue for indefinite period is aimed as a precautionary measure particularly following the recent spate of violence in different areas of Basirhat and also in parts of Nadia that was flared up due to some hate posts in facebook and whatsapp messenger. With this endeavor at least five police stations in Nadia – Kalyani, Chakdaha, Haringhata, Krishnanagar and Santipur today organized discussions where they invited teachers, elected representatives of municipalities and panchayats, students of schools and colleges to appraise about the issue and to take up the issue for awareness. Police officials from different police stations on the other hand visited schools and colleges to educate students about the possible outcome they would face if dared to spread any religious hatred in the form of text or image. A printed leaflet containing an appeal for using social media in restrained manner with ‘DOs’ and ‘DON’Ts’ along with all chargeable legal sections for any cognizable offence for hate and provocative posts and shares and its possible punishments in details was circulated among the attendants. An awareness programme by Kalyani Police. 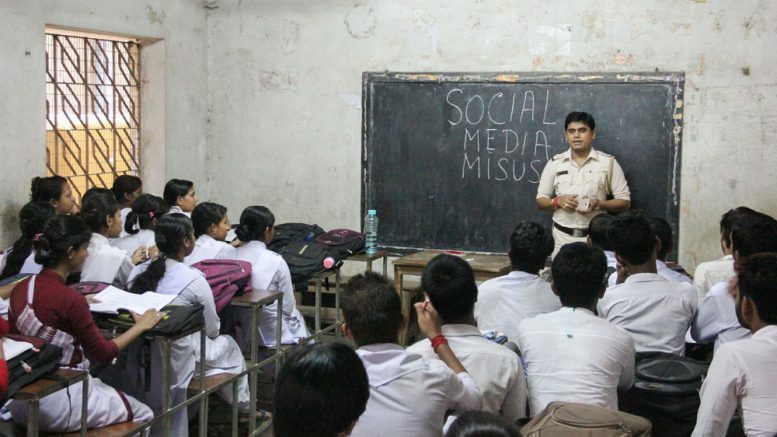 Nadia police superintendant Sheesh Ram Jhajharia said: “Our aim is to educate people and at the same time to make them aware about the ramification of their act on social media. Social media is a strong medium to connect people, but most of the people use it in casual manner and often make irresponsible comments or post image from which they should be restrained for sake of society and for themselves too, because it could land them in jail”. According to a senior officer in Nadia police the initiative taken following a number of allegations were lodged against different persons at different police stations since violence flared up in Basirhat. The recent violence between two groups in Nakashipara’s Sasthi tala area and Kaliganj due to a hate message in whatsapp for which section 144 had to be clamped, led the police to launch the initiative. 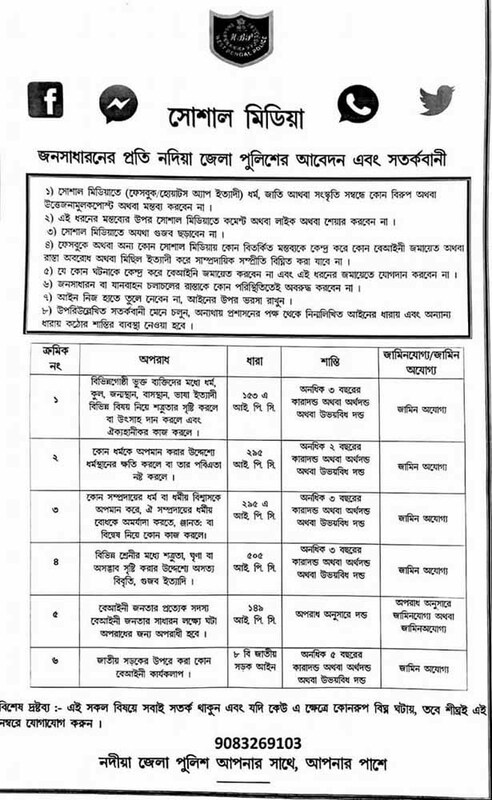 So far around 20 persons were arrested during the last month for hate post in social media, which include an auxiliary worker of state fire service department posted in Karimpur. On Sunday also police arrested a youth from Krishnanagar for a hate post who was later taken to police custody for two days. “We are taking legal action against the offenders and at the same time trying to educate people”, added Nadia police chief Jhajharia. “We urge people to be careful and restrained so that they do not invite troubles and cause tension by making derogatory or controversial comments on any religion by liking or sharing such comments or posts and by spreading any rumour that has potential to disturb social harmony”, added the police superintendent. Students like Priyasha Das, Bappa Sarkar of class XII who attended the awareness programme today at their school Rabindra Bidyapith in Santipur said: “This is a great initiative by police. We are happy to be included in the drive. We were infact unaware that even a clicking a like or sharing a post on religious hatred could attract legal prosecution. We will be careful about this and make others aware too”.